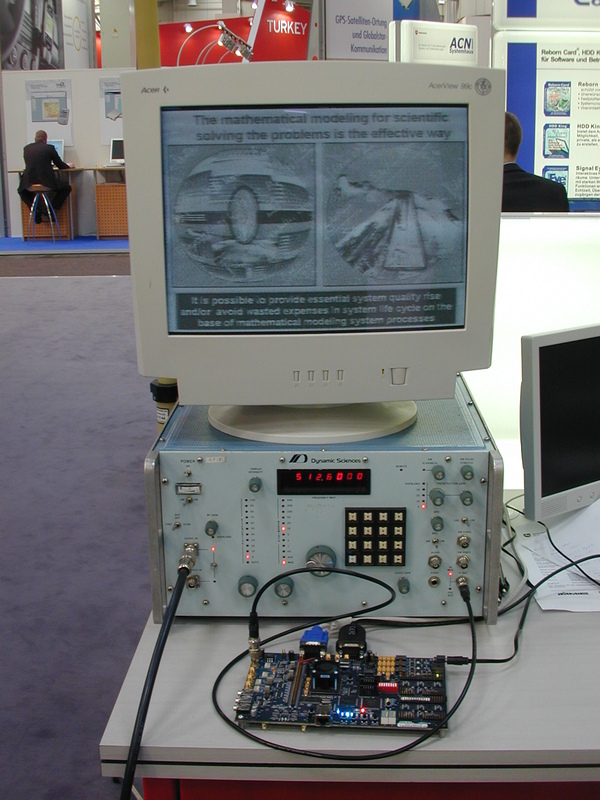 Their paper, “Low cost traffic analysis of Tor”, was presented at the 2005 IEEE Symposium on Security and Privacy (Oakland 2005). It demonstrates a feasible attack, within the designer’s threat model, on the anonymity provided by Tor, the second generation onion routing system. 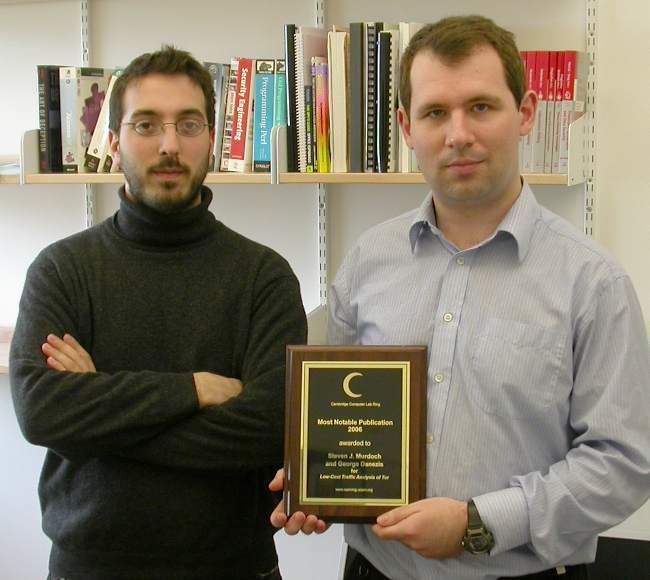 Live from IEEE PerCom in Pisa, Italy: “Is your cat infected by a computer virus?“, the paper about writing a virus for RFID tags, by Melanie Rieback, Bruno Crispo (Cambridge security group alumnus) and Andrew Tanenbaum, which got huge press coverage following its “press release” yesterday, has just been given a “best paper for high impact” award. The official Mark Weiser award went to a system paper, but they made up this ad-hoc award for this one… I’m glad it got an award. Somewhat lighthearted and in part debatable, but it was definitely the paper I enjoyed the most. The authors have a web site for it at (following the perverse fashion of buying a new top level domain for every new thing you do) www.rfidvirus.org. 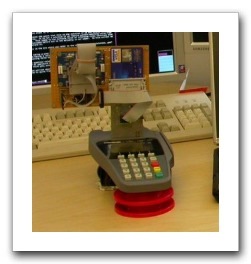 I recently got an email from Bank of America offering me a pretty good credit card deal. Usually, I chuck those offers away as spam (both electronic and physical) but this time I decided to bite. Well, not much assurance there since I replied to the original email (cardservices@replies.em.bankofamerica.com), but a whois query confirms that mynewcard.com indeed belongs to BofA. 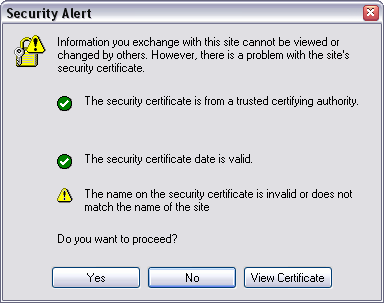 What percentage of the population would go beyond clicking that “OK” on the IE warning as just another annoyance? You know the answer. So, BofA got three things wrong. Firstly, they had links in the body of the email; the argument has been beaten to the ground… don’t educate people to click them. If the bank has great offers, they should have them available when people log into their accounts. 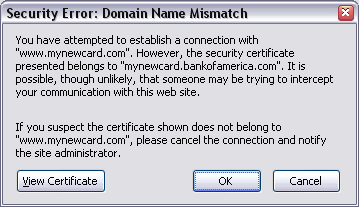 Secondly, they messed up on the certificate… it’s for mynewcard.bankofamerica.com, not what appears in the address bar, mynewcard.com. And finally, they used an unfamiliar domain to process the application. Why? I think the answer lies somewhere in the marketing department where they decided that mynewcard.com is cooler sounding than sound security measures and long term good customer training. Update: Richard mentioned that the rapid response meant that BofA have heard this concern once before. I found this thread [dansanderson.com] discussing mynewcard.com in August 2003! Which adds a fourth thing BofA did wrong: they didn’t fix it! Since my blog post last week, discussion continues on what has actually happened with the new Chinese TLDs and what the consequences will be. Rebecca MacKinnon’s posting on CircleID triggered an interesting discussion. It has also been mentioned on a few blogs including My Heart’s in Accra, Joho the Blog, China Digital Times, Shanghaiist, Virtual China, the LINX public affairs news and even in a Czech blog which I can’t understand. The ICANN Generic Names Supporting Organization (GNSO) mailing list has a thread discussing the move, as does the DomainState forum. I presume this is based on my blog posting, since I am not aware of anyone else in Cambridge having looked into this. Also in the news is a statement from CNNIC, and reported in People’s Daily Online. CNNIC say that reports of new TLDs are inaccurate, but does not explain what the actual situation is. CNNIC’s DNS servers resolve the new TLDs and claim to be authoritative, but perhaps CNNIC means that they are still only experimental, or simply that the press release did not announce any change. CNNIC are accepting registrations under the new TLDs, which does suggest they consider them official. It’s a somewhat pointless game of semantics about whether this circumstance is a “split” root or not. However, it has most of the characteristics that ICP3 [link mine] wails about – most particularly names not being globally visible. I’d say that this situation quacks like a duck and walks like a duck: it’s a non-ICANN approved addition to the top level names of the DNS which is visible to some internet users and not to others. It may be an experiment, but if so it’s a rather large one. On 28 February, People’s Daily Online published an article entitled “China adds top-level domain names”. This suggested that China was going to take over .com and .net and split off from the conventional domains managed by ICANN and operated by Verisign. This appears to be not the case, rather the result of a mis-translation. As pointed out by Rebecca MacKinnon, the new top level domains (TLDs) are .中国 (meaning “China”) .公司 (meaning “company”), and .网络 (meaning “net”), which do not conflict with any ICANN managed TLDs. The normal way to create new TLDs without ICANN’s permission is known as “splitting the root” since it involves creating a new root name server and replacing the root zone file distributed by IANA with your own. 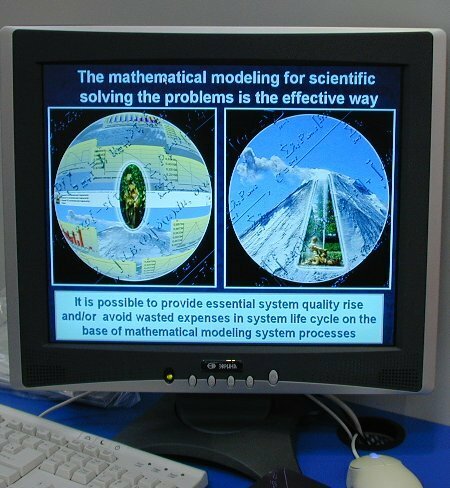 For some background on the role of the root zone file there is a short introduction and a slightly longer version by Daniel Karrenberg. Alternative roots are not new, but what makes the current situation different is that the new TLDs have a (powerful) government’s backing, and with around 100m Internet users (second only to the US) has the potential to have a far larger user base than any that have come before it. There is still some uncertainty on how the new TLDs have been implemented. i-DNS produces a plugin for Microsoft Internet Explorer which allows it to access internationalised domain names as until version 7, IE cannot do this natively. In March 2005 they announced a partnership with the Chinese Ministry of Information Industry to develop the new TLDs and add support to their plugin. Some commenters have assumed that this is the only mechanism used to implement the new TLDs, but as mentioned in the press release, it seems that ISPs have also modified their servers, allowing access to these TLDs from within China without the user having to install any additional software. I do not know when this change was made and how complete the implementation is, but James Seng describes the TLDs as being in operation for 3 years. It appears that technically China has not “split the root” since there seems to be no new root server. Instead, each ISP might have manually added the three new TLDs to their DNS server configuration. When a domain name under the ICANN TLDs (.com, .net, .uk, etc…) is resolved, the server would go to an ICANN root server to find out which organisation is responsible for allocating second level domains. However, when a domain name under one of the new TLDs is requested, the DNS server already knows the nameserver it needs to ask next and can skip the root server lookup. The advantage of this approach for China is that it avoids the cost and difficulty of setting up a new root server, but the disadvantage is that to add another TLD in the future they would have to ask all the ISPs again, rather than adding it to their root. Despite this technicality, what China appears to have done is externally almost indistinguishable from splitting the root and carries the same consequences. The primary problem is that a link using one of the new TLDs will work in China but not outside (without a user installing the plugin, or their ISP making a configuration change). This breaks the universality of the Internet and while I will not go into further detail here, the Internet Architecture Board discusses the effects of a split root in RFC 2826, which is in addition to problems of the landrush resulting from any new domain. I am not familiar with the ISP landscape in China, but I have tried to do some tests to better understand how these changes have been implemented. For testing I am using a DNS server (ns4.bta.net.cn) which I understand to be one used by the customers of a Chinese ISP, but which also allows access from outside. As an example, I used “北京大学.中国” which I think means Peking University in the new “.China” TLD. As Unicode cannot be used directly with DNS, it needs to be translated into Punycode. This gives xn--1lq90ic7fzpc.xn--fiqs8s. xn--1lq90ic7fzpc.xn--fiqs8s. 3600 IN CNAME www.pku.edu.cn. www.pku.edu.cn. 47863 IN CNAME tulip.pku.edu.cn. This means that according to ns4.bta.net.cn, the domain 北京大学.中国 is another name for www.pku.edu.cn and its IP address 162.105.129.12.
. 36996 IN NS A.ROOT-SERVERS.NET.
. 36996 IN NS M.ROOT-SERVERS.NET. It returned only the 13 IANA root servers ([A-M].root-servers.net). These do not list the new Chinese TLDs but the server still knows about them. This means that when this server wants to resolve a domain under .中国 is will ask hawk2.cnnic.net.cn. I get the same result with .公司 (“company”), and .网络 (“net”). hawk2.cnnic.net.cn will also resolve domains under these TLDs and considers itself to be authoritive. Several questions still remain. It is possible that the name server I used is not representative of Chinese ISPs. Also, despite it not listing any alternate roots, it is still conceivable that the server is using one. It may also be acting differently because I am outside of its customer network. However, I think it does demonstrate that there is something happening in addition to the i-DNS plugin. I did briefly try this plugin and examine some aspects of how it works. Internet Explorer 6 and below do not support internationalised domain names (IDNA) at all. Even though Firefox does, as my DNS server in the UK only uses the IANA root servers, only the ICANN defined TLDs will work. So http://北京大学.cn/ (Peking University) will work in Firefox in the UK and China, as the TLD is .cn, but http://北京大学.中国/ will only work in China, as the TLD is one of the new non-ICANN domains. Installing the i-DNS plugin adds IDNA support to Internet Explorer but also adds support for the new TLDs. I am not aware of all the details, but when I visit domain-name.中国 it redirects the user to domain-name.cn, domain-name.公司 redirects to domain-name.xn--55qx5d.aced.net and domain-name.网络 to domain-name.xn--io0a7i.aced.net. The nameserver for aced.net is controlled by i-DNS and, as with the DNS server in China, uses hawk2.cnnic.net.cn for further lookups. It seems that these new TLDs are more complicated than it might first have looked, and this post by no means explains everything. I hope that others will be able to find out more. It remains to be seen what the consequences of this move will be. In their advertisement, i-DNS states that 50m users already have access to these TLDs and if the 4 ISPs which provide access to 95% of China’s Internet users add the TLDs then the remaining 5% will inevitably follow. Also non-Chinese ISPs with a significant number of Chinese-speaking users will be under pressure to add these TLDs, and have very little incentive to not do so. While previous alternate roots have languished in the obscurity of a narrow user-base, the potential of 100m (and growing) users will make this TLD hard to ignore. Perhaps in an attempt to avoid a split Internet, ICANN will adopt the TLDs and so roll them out to the standard root servers. Whatever they choose, I hope the disruption to the Internet from the resulting politics will not be too severe.